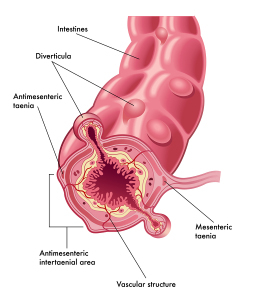 Diverticular disease, also known as diverticulosis is a large intestinal disease where pockets form that can get infected and abscessed. 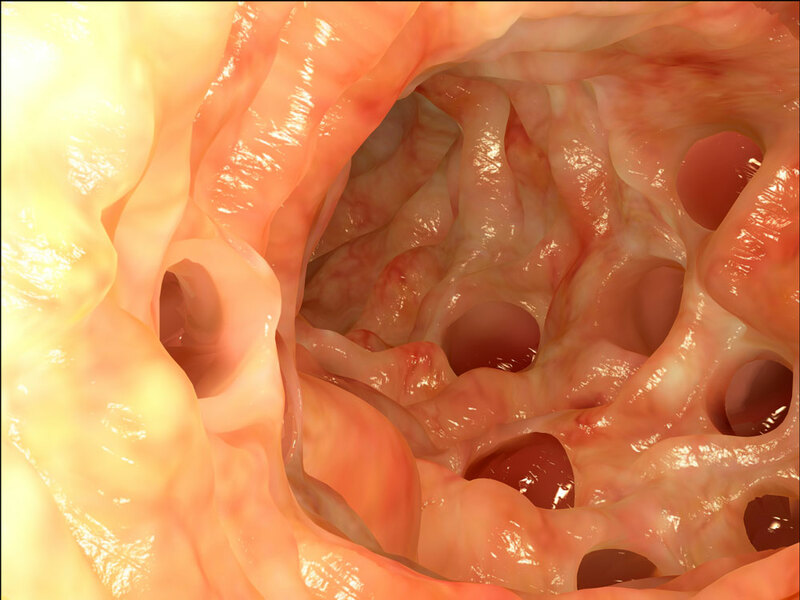 The colon normally has muscle fibers everywhere in the wall of the large intestine. However, with chronic constipation and a low fiber diet over many years the intraluminal pressure in the colon is too high leading to a pouching out at the weakest point of the bowel wall. It is like a mini-hernia and the lining of the colon herniates through a hole in the muscle layer of the colon. This is the beginning of a diverticulum, which normally is 1/4 to 1/2 inch in diameter. When many diverticles have developed, the condition is called “diverticulosis”or “diverticular disease”. This is an abnormal condition, but is still considered to be normal in the person aged 40 or older. In a 90 year old person there are usually many diverticles present. Fortunately, with a reasonable fiber rich diet diverticulosis is not even noticed. However, two complications can occur. There can be sudden bleeding from a diverticle (seen as rectal bleeding) because of irritation from a piece of old stool that may have been caught in it. If the bleeding is more than 1ml per minute, a special procedure may have to be done, where an arterial catheter is introduced into the main leg artery. Through the catheter the cardiologist can identify the bleeder and inject a substance, which contracts the blood vessel and in about 70% of patients this will stop the bleeding. The surgeon will likely recommend removal of the diseased segment of colon by way of a segmental colon resection. The other complication is a colon perforation of such a diverticle and this would lead to an acute abdomen with resulting peritonitis due to the extreme load of bacteria from, the colon with E.coli and anaerobe bacteria. This requires usually a two stage procedure with initial laparotomy, oversewing of the perforation and a colostomy (artificial opening of the proximal colon to the skin). At a later stage the segmental colon resection would be done with an anastomosis of the colon (end-to-end) and a colostomy reversal.